MANA’s Board of Directors is pleased to announce that Tommy Garnett has been elected to MANA’s Board of Directors. Garnett is president & CEO of MANA member Garnett Component Sales, Inc. (GCS), Wake Forest, North Carolina. 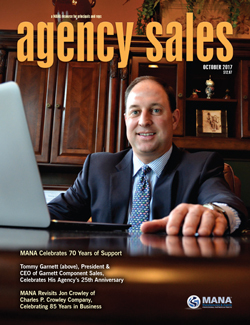 Garnett and his firm were featured on the cover of the October 2017 issue of Agency Sales magazine. GCS focuses on engineered mechanical component requirements for the OEM community. Learn more about GCS at www.gcsrep.com.